With our systems on AWS, we can scale our resources more than 130-fold in 30 minutes, enabling us to support more than 2,500 orders per second. Founded in 2013, tixCraft sells online tickets to concerts, sporting events, film festivals, and other events in Taiwan. The company’s services to clients include creating and managing event ticketing, offering tickets for sale through a range of channels, delivering real-time sales reports, and providing on-site box-office services through a management console. The company is the latest venture from ticketing and promotions specialists who have been operating in the industry for more than a decade. At the outset, tixCraft ran its ticketing platform and associated systems on servers, storage, networking, and other systems in an on-premises data center with a local IDC provider. However, this infrastructure could not scale to support surges in traffic when tickets for popular entertainment acts went on sale. These surges could render tixCraft’s websites and mobile applications inaccessible for up to several hours, frustrating and angering fans of the entertainers in question. The business needed to move to an infrastructure that could scale out to support demand peaks without incurring massive capital and operating costs. The infrastructure also had to deliver close to 100 percent availability to ensure fans could access the service for information and tickets from any location with a web connection. The tixCraft AWS architecture also incorporates Amazon Elastic Compute Cloud (Amazon EC2) instances that provide scalable compute resources for the tixCraft systems and Amazon Simple Storage Service (Amazon S3) to load and stage static files like scripts and image files to speed up users’ loading time and improve website performance. Elastic Load Balancing distributes user traffic across the Amazon EC2 instances to ensure the tixCraft applications are fault tolerant, while Auto Scaling allows tixCraft to automatically increase its compute capacity during demand spikes that occur when tickets are released for popular events, and scale down as demand subsides. Amazon Route 53 provides domain name system (DNS) services that enable tixCraft to route users to its websites and internet applications. The company also benefits from using AWS Support to resolve issues that arise. Chiu describes the experience with AWS Support as “very good,” with issues resolved quickly. The company has experienced a range of benefits from moving the infrastructure supporting its ticketing platform and associated systems into AWS. The business can seamlessly scale to support demand peaks such as selling 120,000 tickets in 12 minutes for popular artist aMEI I AMIT Utopia’s 10 concerts at the Taipei Arena, and more than 30,000 tickets in three minutes for Korean pop band BIGBANG’s concerts at the same venue. “With our systems on AWS, we can scale our resources to more than 130-fold in 30 minutes. This enables us to support more than 2,500 orders per second,” says Chiu. 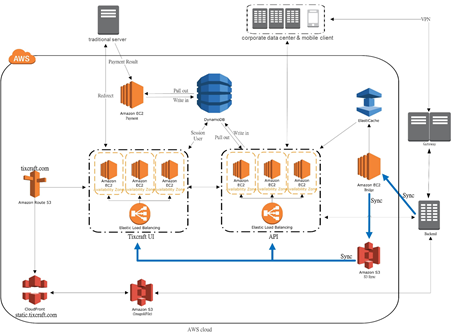 Using Amazon DynamoDB has enabled tixCraft to increase read-write input-output operations from 20 to 135,000 per second, allowing the business to accommodate more than 100,000 concurrent users online during the peak time, and to capture and manage large data volumes for analysis and reporting when required. To complement its scalability, tixCraft's infrastructure running on AWS is delivering 99.999 percent availability. This provides confidence to users who can now reliably buy tickets or find information about events, experiencing website responses times at an average rate of 1.3 seconds. Clients can also rest assured that tixCraft can deliver large-scale ticketing services without problems. “Promoters will now engage us to sell tickets to large, popular concerts. This has been a very big vote of confidence in our service and helped enormously with our business growth,” says Chiu. To further reduce the total cost of tixCraft’s infrastructure expenditure, the business moved part of its compute capacity from on-demand Amazon EC2 instances to Amazon EC2 Spot instances recently. “We have the newly released Amazon EC2 Spot blocks that guarantee the Spot instance will run continuously for up to six hours, and one hour is all we need to sell all tickets. This saves us money, without compromising stability,” says Chiu. The team at tixCraft is obtaining these benefits while dedicating only one full-time engineer to manage a up to 20 servers in the AWS infrastructure during special events that generate high transaction volumes. “For one popular recent event, we spun up to 800 Amazon EC2 instances to support demand. I cannot imagine how many administrators we would need to administer an equivalent number of servers if we elected to deploy a physical infrastructure,” says Chiu. For Chiu, the experience of using AWS has been “full of surprise and delight,” and he is keen to explore further the benefits that AWS can deliver. “We discovered while undertaking this project that we needed to equip ourselves with a greater knowledge and understanding of what AWS is doing in future, and how we can use this in our operations,” he says. To learn more about how AWS can help power your web applications, visit our Web Applications details page.